1 Is A Meal Replacement Shake Suitable For Me? 2 Is 18shake Right For Me? 8 How much does 18shake cost? Have you ever looked into weight loss supplements or programs? If so, you’ve probably considered a meal replacement shake at one time or another. But, these products often contain nasty, artificial ingredients. Do you want a weight loss shake natural ingredients? If so, 18shake luxury meal replacement shakes could be the product for you. Is A Meal Replacement Shake Suitable For Me? Meal replacement shakes are the most common type of weight loss supplement on the market. But, they are not suitable for everyone. While these shakes do contain protein, they are not protein shakes. There is a big difference between meal replacement and protein products when it comes to nutritional content. Meal replacement shakes often contain low calories, and minimal fat or protein. So, they will fill you up, but they usually are not an adequate supplement for a healthy diet. These products are generally suited to time-poor people. If you need a quick, precise way to track your calories and lose weight, this could be for you. But many weight loss shakes do not contain the essential micro and macronutrients. Thus, these products might not be suitable for everyone. Consult your doctor if you have vitamin deficiencies or other pre-existing health concerns. Is 18shake Right For Me? The 18shake weight loss shake brands itself as a “luxury meal replacement” product. This product only includes natural ingredients and no artificial colours, flavours or preservatives. So, 18shake is an excellent option for people who want to try a weight loss shake without harsh chemicals. 18shake is a luxury meal replacement shake, with a higher price point than alternative products. So, the product may not be suitable for people looking for an affordable product. The weight loss shake contains whey protein, so it is not a vegan-friendly product. But, 18shake is gluten-free. So, the product suitable for coeliacs or people with gluten sensitivities. 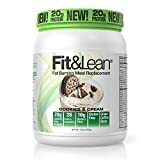 This product won the award for the best diet shake of 2019. With high-quality ingredients and excellent customer reviews, it is a highly regarded product. If you have the financial stability to invest in a luxury shake, this product could be a great option. 18shake is a meal replacement shake produced by the brand of the same name. This product is the brand’s primary focus, as evident on the company website and in the company name. The shake recently won the award for the best meal replacement shake of 2019. 18shake is a luxury product with a primary focus on high quality, natural ingredients. So, it is a healthier choice than shakes that contain lots of artificial additives. 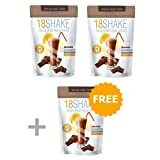 18shake contains high-quality ingredients including whey protein, Stevia natural sweetener, and natural cocoa. 18shake contains the natural ingredients to back up its claims. This is unlike many of its competitor products, which contain artificial ingredients. The “18shake” name refers to the 18 essential vitamins and nutrients that are in the product. This is on top of the product’s high protein and fiber content. 18shake contains no soy, gluten, artificial colours or flavours. So, it seems like a healthy choice for meal replacement. Despite its high rating, there are still some negative reviews about this product. So, it is not a sure-fire success for everyone. The ingredients in 18shake are the product’s main selling point. So, it is worth investigating what the shake actually contains. 18shake meal replacement shakes contain 90 calories per 27-gram serve. This includes 15 grams of protein, 1.5 grams of fat and only one gram of sugar per serve. The product also contains 5 grams of fiber and many vitamins and minerals. This includes vitamins A, B, C, D and K, thus making the product an excellent meal replacement. The 18shake formula uses whey as it’s primary protein source. Whey protein comes in many different forms. This product contains two types of whey protein. 18shake contains whey protein concentrate (WPC) and whey protein isolate (WPI). Whey protein concentrate (WPC) is approximately 75% pure protein. Lactose and fat compounds make up the other 25%. This is the cheapest, most natural and considered the best tasting form of whey protein on the market. Whey protein isolate (WPI) is a more refined, highly processed form of whey protein. This type contains more than 90% pure protein. The whey is treated to remove the extra lactose, fat, carbohydrates and calorie dense ingredients. WPI is considerably more expensive than WPC but is also a more concentrated product. Fibersol-2 is a soluble fiber source that is a by-product of corn. This ingredient is low in calories and extremely high in dietary fiber. Thus, Fibersol-2 has many weight loss and digestive health benefits. This ingredient helps to make you feel fuller for longer by releasing the PYY and GLP-1 hormones. These hormones send the “full” sensation from your gut to your brain. Additionally, Fibersol-2 can assist with regulating digestion and relieving constipation. Mix one scoop (approximately 27g) of 18shake powder with 8oz of water. Use to supplement one or two meals daily. You can also add the powder to your favourite smoothie recipe or blend with almond milk and banana. This will make a more calorie dense shake. How much does 18shake cost? 18shake is a luxury product with a luxury price tag. One pack (plus the free meal plan book) retails for $79.98 for 16 serves. Considering the product recommends 1-2 serves per day, one pack will last 8-16 days. This compares to most rival products, which charge for a monthly supply for a similar price. This product is about twice the price of other meal replacement shakes on the market. Although 18shake contains high-quality ingredients, it is much more expensive than rival products. These competitors often have products with similar macro and micronutrient contents. 18shake claims to provide the fastest weight-loss results of any meal replacement shake. Customer reviews and scientific evidence support the claims put forth by 18shake. Most of these benefits are due to the extreme calorie reduction of the product. One serve of 18shake is about six times smaller than a typical meal for an adult. While this is a quick weight loss solution, it can often be difficult to maintain long-term. But, it is important to note that there is a disclaimer provided on the company website. The disclaimer states that results are not guaranteed and may vary between individuals. 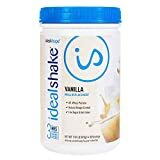 18shake won the best weight loss shake of 2019 award. This emphasises the product’s enormous customer support. The positive customer reviews mention the product’s tasty flavour and its effectiveness. Customers also replaced two meals per day without feeling unsatisfied or hungry. Customers also noted that 18shake was the most effective of all the meal replacement shakes they have tried. But many customers claimed to be unhappy with the product’s price. Some customers suggest using smaller serving sizes to extend the life of the product. Like any product, there are some negative reviews. Many of the negative reviews refer to the product tasting too artificial/sweet. Yet other reviews discuss the product’s effectiveness. Some customers claim it does not curb their appetite enough. Taste and effectiveness are subjective. So it is worth noting that this product is raved about by many, but it is not a perfect solution for everyone. These customers also recorded the cost as a reason for their negative review. The reviews of 18shake are mostly positive. There are no reviews that we could find that mentioned side effects or illness caused by the product. It is easy to see why the 18shake meal replacement wk\on the best weight loss shake of 2019 award. The product contains high-quality ingredients and makes reasonable claims for a meal replacement. Scientific research and anecdotal customer reviews support these claims. Thus verifying the claims put forth by 18shake. If you are looking for a meal replacement shake, 18shake could be an excellent option for you. This product is not suitable for everyone. But, it has a wide range of benefits suited to most people looking to lose weight using supplement products.